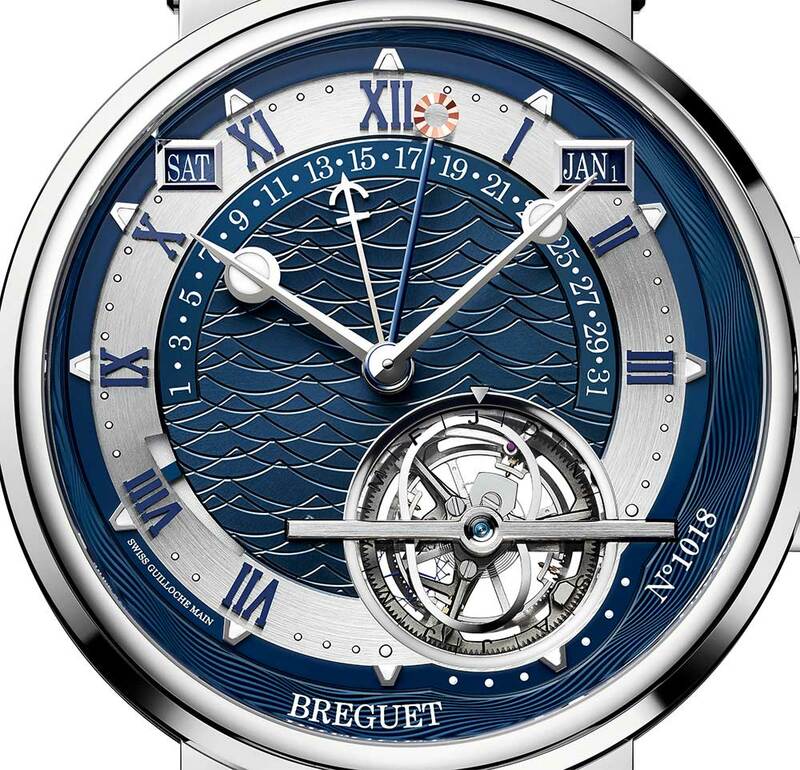 The Marine Équation Marchante 5887 by Breguet is an unusual timepiece in many ways. Its appearance is part that of a sophisticated complication watch, part classic Breguet, and part sports watch. 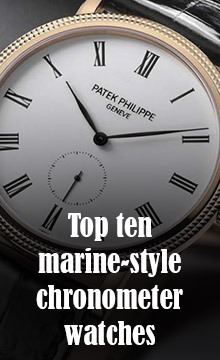 It is 43.9 mm in diameter, about 11.5 mm thick, in platinum or rose gold, and it has a water resistance of 100 metres, meaning that it really could be taken to sea on a yacht and stand up to spray and waves breaking over the stern. 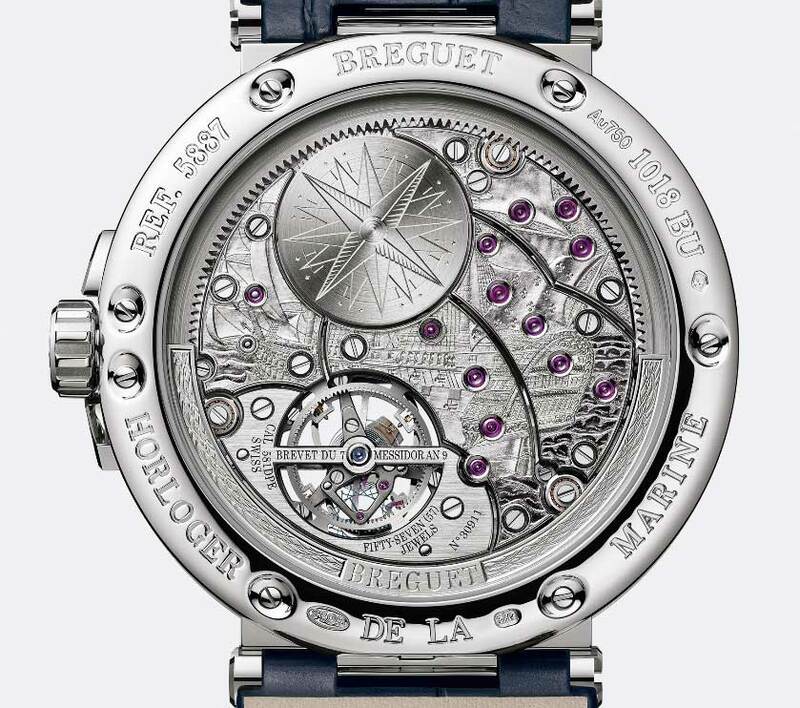 The classic Breguet features are modified to give them a different, younger character. The rings on the Breguet hour and minute hands are filled with SuperLuminova, and the Roman numerals –modern in their design – have luminous hour markers just outside them. The chapter ring for the hours, asymmetrically positioned, contrasts with the central part of the dial, with an unusual wavy motif created by hand-guilloché, a Breguet speciality. The caseband fluting is wider, and the central lugs for the alligator strap also have a more modern appearance. The watch combines three complications, tourbillon, equation of time, and perpetual calendar. The rectangular calendar windows, for day of the week and month, are accompanied by a retrograde date hand with an anchor-motif pointer. The watch is powered by Calibre 581DPE, which has 57 jewels. 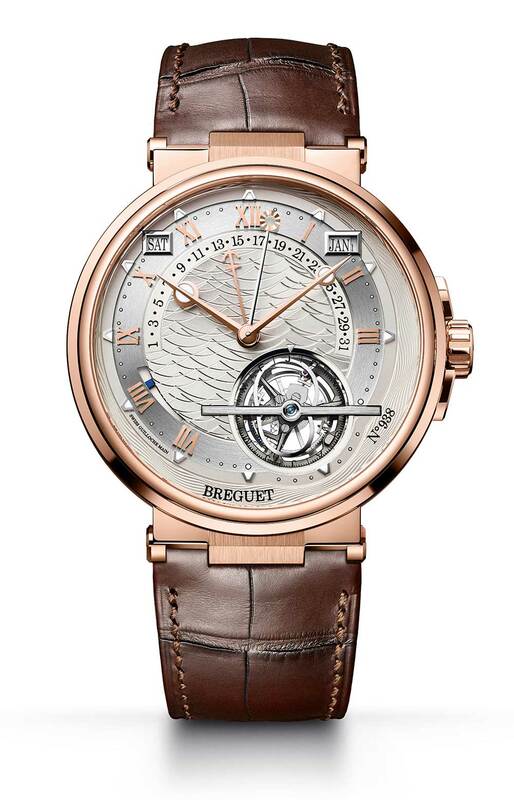 It is based on the ultra-thin Calibre 581DR used in the Breguet Classique Tourbillon Extra-Plat Automatique 5377, to which the perpetual calendar module has been added, and the tourbillon has been modified by adding the cam for the equation of time. 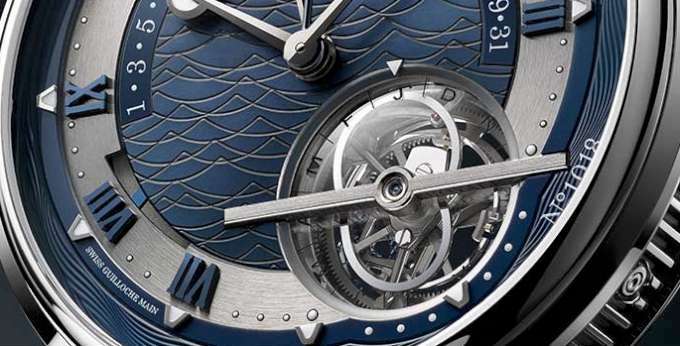 The notable feature of the Marine Équation Marchante 5887 is the way in which the equation of time is displayed. Normally a watch with this complication – which displays the difference between mean solar time, standard hours and minutes, and true solar time, by from minus 16 minutes to plus 14 minutes – has a cam driving a display that shows how many minutes you have to add or subtract from mean solar time. In the Breguet 5887, the kidney-shaped cam above the tourbillon is like a track, along which a ruby-tipped lever, the feeler-spindle, runs, over the space of one year. It transmits the difference to a rotating wheel whose movement is combined with the movement of the conventional minutes wheel by means of a differential gear. As a result, you can read both mean solar time, shown by the conventional minute hand, and the true solar time, indicated by the hand ending with a gold sun motif. The cam for the equation of time rotates over the course of the year and the sapphire glass window above the tourbillon is marked with letters for the months, used for setting the watch. The combination of the cam for the equation of time on top of the tourbillon partially obscures the view of the 60-second tourbillon, something that usually has pride of place on the dial of this sort of watch. 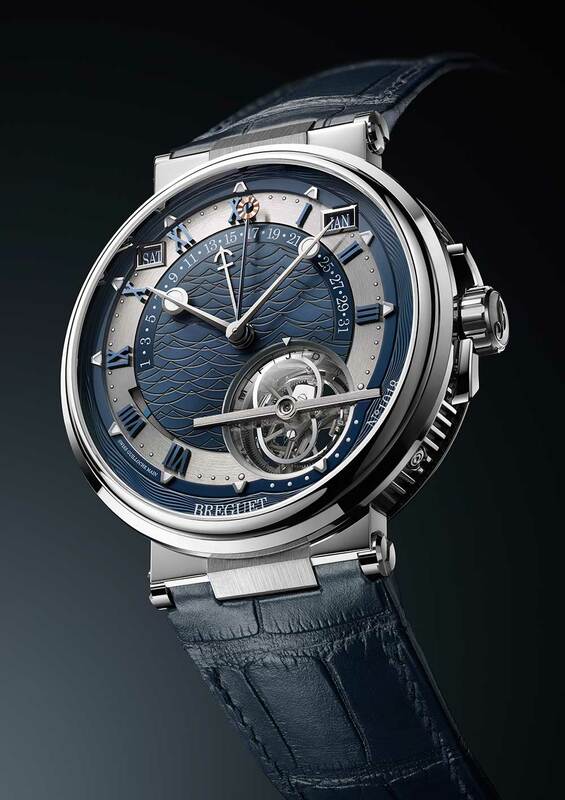 However you can read the seconds from an arrow on the tourbillon carriage. The tourbillon incorporates Swatch Group silicon technology, with a balance spring and escapement made in this material that improves isochronism and reduces friction. The balance runs at 4 Hertz. The mainspring provides an excellent power reserve of 80 hours, indicated on a window at 8 o’clock. 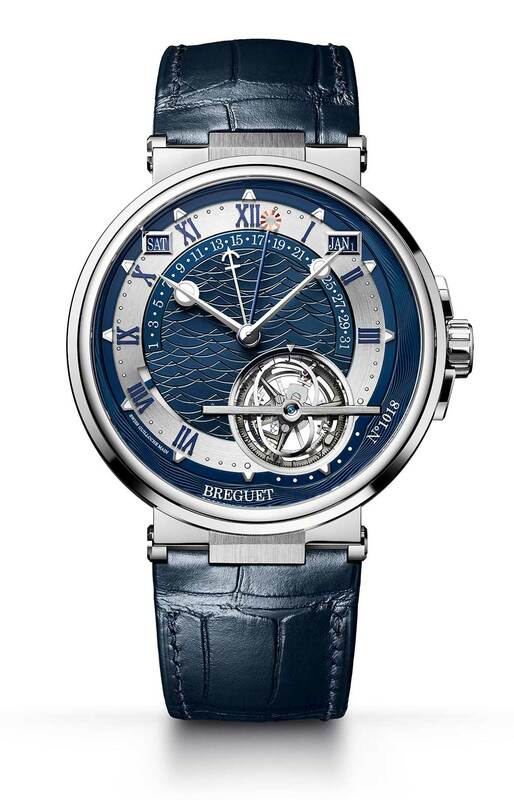 The Marine Équation Marchante 5887 by Breguet is available in platinum, reference 5887PT/Y2/9WV, at the price of €220,700. It has a rhodium-plated movement. The same watch is available in rose gold, reference 5887BR/12/9WV, with a silvered dial and anthracite movement, price €212,500. 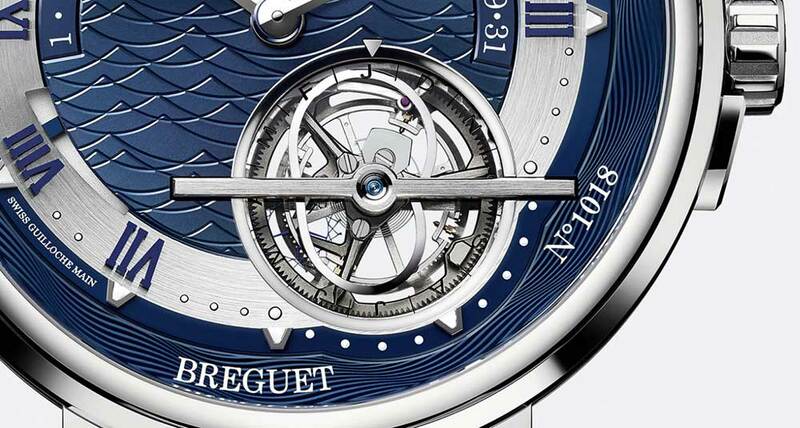 More information at the Breguet website.